The San Jose Blog: Knight Foundation Donating Over $1 Million to San Jose Projects! Knight Foundation Donating Over $1 Million to San Jose Projects! The John S. and James L. Knight Foundation has decided to donate over $1,000,000 to projects that will benefit San Jose. The top priorities were projects that will help with branding and identity, transforming public spaces, and helping the next generation of emerging leaders. A total of 15 projects were funded. Some are quite interesting such as a new prototyping festival along Paseo de San Antonio, a pop-up park at Plaza de Cesar Chavez, and a new food and community hub at the Taylor Street urban farm. Below is the full list of projects. California Walks ($30,000): Encouraging deeper resident attachment to San Jose by launching San Jose Walks, a program that encourages urban exploration and celebrates neighborhoods through walking. City of San Jose, Department of Parks, Recreation and Neighborhood Services ($150,000): Helping to improve public spaces in San Jose through a "Parks Activation and Prototyping Fund" that will allow people to experiment with new ways to use parks. City of San Jose, Office of Economic Development ($125,000): Launching a branding and marketing campaign to attract talented workers, create jobs and bring new opportunities to the city. Exhibition District ($20,000): Creating a more vibrant and connected San Jose by expanding the Exhibition District, a public art project. Garden to Table ($60,000): Creating a food and community hub at Taylor Street Farm that will include events, workshops and market days, while supporting local food producers and suppliers. Groundswell Design ($75,000): Creating a pop-up park at Plaza Cesar Chavez that aims to transform an underused space into a vibrant and engaging public area. Local Label ($48,958): Launching a citywide competition to create and promote new branding opportunities for San Jose developed by teams of local artisans and makers. National Arts Strategies ($30,000): Supporting a group of San Jose Creative Community Fellows through a nine-month fellowship program focused on creative placemaking. Opportunity Fund ($75,000): Helping Downtown San Jose's small businesses (particularly restaurants and retail) comply with EMV chip requirements, a standard for credit card and debit card payments, through a merchant equipment subsidy program. 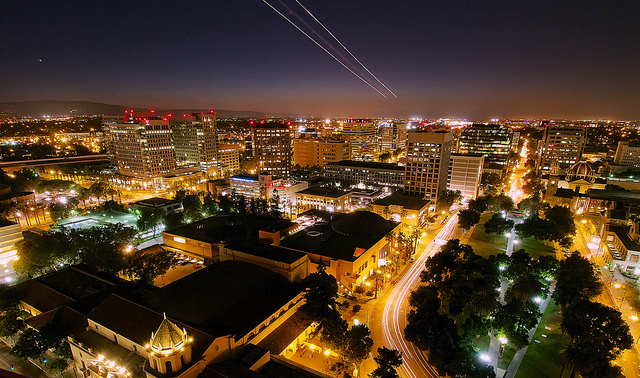 San Jose State University ($240,000): Developing a more vibrant and connected San Jose with the launch of a prototyping festival along Paseo de San Antonio, a series of Ed talks, an artists-in-residence program and new activities at the Hammer Theatre. School at Mexican Heritage Plaza ($10,800): Connecting people and increasing civic participation by launching ImagineSJ, a monthly event and panel discussion focusing on San Jose's arts and cultural scene. Silicon Valley DeBug/NEEBA ($30,000): Creating a "We are San Jose" video series to share the dynamic and diverse neighborhoods and communities of San Jose. Sustainable Agriculture Education ($35,000): Supporting research, analysis and reporting focused on developing ways to connect and grow the city's food ecosystem. Somos Mayfair ($21,280): Helping people get more involved in shaping their community through Mayfair Community Mini-Grants that will invite local Mayfair residents to develop innovative ideas to make their community better while introducing them to local decision-making and budgeting. Transform ($100,000): Supporting more affordable and transportation-friendly housing by creating tools and traffic reduction strategies as part of GreenTRIP, a green building certification program for new residential, mixed-use development. - Silicon Valley DeBug/NEEBA ($30,000): Creating a "We are San Jose" video series to share the dynamic and diverse neighborhoods and communities of San Jose. - City of San Jose, Office of Economic Development ($125,000): Launching a branding and marketing campaign to attract talented workers, create jobs and bring new opportunities to the city. Has the problem with the city been that people don't know about it? Somehow, I doubt that.